Over the last several months, we’ve seen the rise of viral LinkedIn posts. Millions of views, comments, and website visitors. Are you getting your slice? To get ours, we took a scientific approach. We immersed ourselves in the data. Rather than relying on hunches, we wanted to know at what point you can consider a post viral. How many Likes or Comments does it take? We tested whether comments correlate to views. We missed the mark. Then we tested whether Likes correlate to views. We hit the bullseye. At BAMF Media, we already A/B test our own LinkedIn posts. We know when we’ve hit virality to the point where if posts are not getting strong enough engagement, then we take them down. If it’s within the first hour, we still have time to adjust. Rewrite the first line. Draw in the emotion sooner. Emphasize the pain harder. This process is raw. It’s intuition combined with our best practices and relentless obsession for excellent copy. It’s not a science, but it works. Here are our results so far. That’s how many views a post will get for every Like – on average – with a 90.04% confidence. LinkedIn posts have a limited window. Most only go viral for three days. 72 hours in three days. 704 likes / 72 hours = 9.78 Likes/Hour. Let’s assume that people are asleep 8 hours a day. That leaves us with 16 hours. 16 x 3 days = 48 hours. If you are aiming to get 100,000 post views, make sure that you get 15 Likes in the first hour -minimum. Without taking any other velocity engagement metrics into account (which we don’t have the data for yet), you need, at least, 15 likes in the first hour of a post if you want to get 100,000 views. How about 1 million views? 1,000,000 / 142 = 7,042 Likes / 72 Hours = 97.80 Likes within First Hour. Taking into account the views per like rate increase as posts gain velocity and LinkedIn’s algorithm picks it up, then this number is around 50 – 60 Likes. 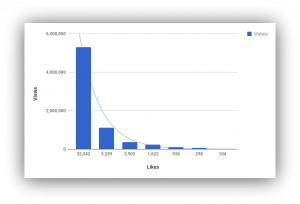 If you want to get 1 million views, keep A/B testing your post until you get ~ 50 – 60 likes within the first hour. Our views per like ratio is 90% accurate when analyzing posts after they’re live for three days. Finding how to weigh likes and engagement more accurately in the early hours is our goal moving forward. If you’re interested in running a linear regression model to find slope and correlation between engagements and post views, then there are many tutorials readily available via Google. INITIAL GOAL: Create an accurate estimate of “Post Views” even though it’s not public. Profile Name Date Comments Likes Views Estimated Views Views/Likes Views/Cmts Est. Views Cmts. Even if the magic number of Likes in the first hour is between 50 – 60, it doesn’t mean your post will go viral. You need excellent copy to attract engagement. If you can transfer enough emotion to the reader, then you’ll get engagement. If all you have is a magic number – that won’t move the needle. So before you think you have it all figured out, buckle down, and write excellent copy with an aim to hit the viral benchmark. If you’re looking for more LinkedIn growth hacks, stay tuned and get notified of our Product Hunt launch by subscribing to our weekly updates here.